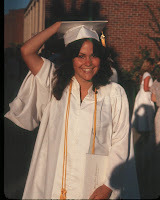 There may be a few of you out there still blissfully unaware that I was the Monta Vista High School Bank of America German Award recipient of 1980. Anyway, back to the topic at hand: Zeitgeist. Since I can claim the very slight, very dubious, very out of date honor of the aforementioned German award, I know what Zeitgeist means. Literally. Zeit means time, and Geist means ghost. The term has come to refer to certain prevailing thoughts and ideas of an era. But in literature, the German Romanticists utilized Zeitgeist not only as an ephemeral spirit of the times, but as an actual character in their novels. This got me thinking. What form would Zeitgeist take, as a character in the story of our times? A character can impose its will, interact with other characters, experience moments of heroism and/or meanness, share its gifts...and fail from its faults. A literary character has an arc -- it changes over the course of the tale. If I was casting the role of today's Zeitgeist...I would jump on the paranormal bandwagon. Way more fun than reality, and as far as supplying characters, the supernatural world offers all kinds of timeless, yet time-specific, tropes. After all, if it was good enough for Mary Shelley's Frankenstein, isn't it good enough for us today? But should I choose an immortal, bloodsucking, soulless creature...or a shambling, brain-jonesing, mess? Which would you choose? In other words, are you team vampire, or team zombie? One blogger presents the idea that in the current political landscape, vampires are red, zombies are blue. Apparently democrats fear the idea of vampires (the aristocracy sucking the people dry); whereas republicans are scared of zombies (shuffling, poorly-dressed folk--apparently without health care-- looking to eat brains.) Hence when republicans are in office, the vampiric specter is raised, while democratic control of the white house leads to widespread zombie outbreaks. Or maybe this overcomplicates matters. Maybe our interest in zombies is simply a natural reaction to the reality of economic recession and shrinking resources. They're a symbol of apocalyptic, diseased immortality, after all; a real downer of a Zeitgeist. On the other hand, could our current literary treatment of vampires --casting them as misunderstood love interests rather than deadly snakes-- be a thinly veiled plea for gay rights? For comprehensive immigration policy reform? For acceptance of the classic Other? What do you think? Would our current Zeitgeist be better represented by a zombie, or vampire? Or a werewolf, for that matter, or another kind of monster...how would you envision the Ghost of our Times? And, perhaps most importantly: who the heck would play him -- or her-- in the movie? ahhhh julie you are brilliant. I am going to snip out bits of this and toss it around as my own in editorial discussions. (SO relieved to discover I chose the politically appropriate creatures.) And also so relieved you know everything....don't know why i bothered consulting a dictionary when I could have just asked you!! I think you're definitely onto something with the apocalyptic, society-in-decline angle. Didn't the whole zombie phenomenon really explode not long after 9/11? On a more serious note, I think "The Time Ghost" would make an excellent villain on "Doctor Who." Rachael -- same right back atcha, babe. Love you lots, and miss you! And I'm with you on the "behind the times" syndrome -- still living in the twentieth century at my house. Soph--you're always on the right side!!! ANd you're right, I really do know EVERYTHING. Just everything. That's me. Steve-- Doctor Who? That would be perfect!!! Oh, and Steve, I said I won the award in 1980. Nineteen-eighty. That was soooooo last century, in so many ways. I think our level of German conversation is just about equal at this point ;-) Nexte Woche! 1. Human can't digest human blood. Guys used to exploit that fact to get F4 draft board designations. 2. Viruses destroy, they don't create new structures or capabilities like ability to digest human blood. Therefore, vampire are far less likely to exist than ghosts!!! Sure, back when there was a declining aristocracy whose loss of control *might* have meant social chaos, Dracula was relevant (and throw in a soupcon of sexual repression that hasn't been an issue in the blue states for quite some time). Now, it seems symbolic of a rush to embrace ignorance. Don't worry, my husband thinks I'm crazy on this point too. I'd cast Lewis Black to play Zeitgeist in current times. Angry and frustrated with current absurdities (seriously, you dug a well with no idea how to cap it in a worst-case scenario? REALLY? ), impotent to change them, generating even more frustration. That sounds bleaker than I mean it. It's just the zeitgeist. As soon as we get some more reds & blues cooperating, it'll become a real ghost. I hope. This is great Mysti! Trust you to make a truly thought-provoking comment...didn't know that about digesting human blood, and I simply ADORE the suggestion of Lewis Black to play our Zeitgeist!